The Fantastic Four team have not been treated well when it comes to movies. The original two films back in 2005 and 2007 suffered from inherent goofiness and ridiculous narratives; so, when this much more intense looking reboot was announced and advertised, I was extremely enticed to see how it'd turn out. I drifted away from paying attention to it for a while after, and when I came back closer to it's release, I found horrendous reviews from both critics and audiences, and dismal box office figures. Just what the hell happened here? 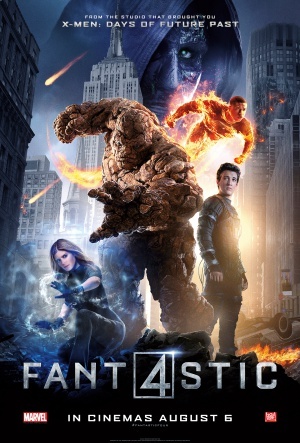 Fantastic Four is an origin story that explores humanity's attempt to teleport to another unknown world to potentially harness it's unique resources. The genius mindset of young scientist Reed Richards (Miles Teller) is brought on board, alongside Ben Grimm (Jamie Bell), Johnny Storm (Michael B. Jordan), and Susan Storm (Kate Mara), as well as the disgruntled Victor von Doom (Toby Kebbell). The group decide to teleport to the world themselves when the machine is seemingly complete, but this gravely backfires, mutating them into beings with strange supernatural powers - and unleashing a friend turned enemy that they must stop before it's too late. Sounds okay, doesn't it? It isn't. Director Josh Trank supposedly struggled on this film due to poor communication with the producers, and his vision was seemingly taken from him when the studio dominated production towards it's final stages. Whether this is true or not we don't know, but we can safely say that something went badly wrong in the midst of it. The pacing of the narrative is an absolute mess; it takes ages for the superhero team to come forward, and when they do, the film adopts time jumps to shrug off any development, making it a jarring experience. The team has absolutely no chemistry and don't really do anything together throughout most of the film. It's even stranger towards it's ending; it feels like we're still in the middle, but suddenly when the villain turns up we're immediately at the climax, then ten minutes later it's all over. There's also a really dull tone throughout, lacking fun and excitement that a superhero movie really needs to have, regardless of how "serious" it aspires to be. Doom himself looks awesome, and Kebbell does admittedly give him a disturbing tone, but otherwise he's a lousy, generic foe with little thought behind his motivations. The story is all over the place, juggling around the importance of each character and struggling to focus on any of them in a well structured manner. In terms of action, we have literally nothing of interest; even the final battle is boring and over very quickly. The cast in general is good, and they perform well enough despite the atrocious script, and of course the special effects still dazzle, but this just isn't enough to save Fantastic Four from being one of the worst superhero movies in recent times. Avoid at all costs.